Last week, we released the first part of this interview. In that part, Srikanth had shared his experience with starting up Fractal, the challenges faced by the team and how they overcame the challenges. If you missed that part, you can read it here. If you are someone like me (who wants to learn more about Analytics) and have read the first part, this part of the interview is for you. I gained immensely from this interview and I am excited about extending this experience with all of you. In this part of interview, Srikanth shares their hiring, training, and managing strategy at Fractal; and how Fractal, expects their people to choose their own career, and manages employee attrition. KJ: Fractal has produced some of the best Analytics professionals in Indian Analytics Industry. How do you hire people? What do you look at time of hiring? How do you train them once they are hired? How do you ensure that they contribute what they bring to the table? Most important thing to look for is Passion for Analytics. (Remember, this was first thing out of the 3 things to look out for in life). Frankly, when you get into depth of analytics, things get difficult. You need to get into details while slicing and dicing data. If you don’t have passion for analytics, you may not succeed when you get there. Next, we look for strong understanding of probability, mathematics and statistics. We also look for structured thinking like any consulting company will look for. Can the candidate take an amorphous business question and then structure it to come out with various hypothesis and a business solution? Apart from these skills, we also look at values. People need to work in very collaborative manner with teams across the globe. So, we look for integrity and commitment to work . We have created an environment in Fractal where we put extreme trust in our people. We don’t monitor their inputs. We are always on the look out for people who fulfill this extreme trust and not violate it. We look for people who can sustain a very high trust culture. We believe that not having to micro-manage people creates an extremely happy and creative workplace. In fact, while recruiting people in the middle-management, we ensure we do not hire micro-managers. We have a pretty robust on-boarding programme for 5 weeks. It includes 3 weeks of class-room training, followed by a 2 week program which involves, working on a business problem in teams. All the concepts (like structured thinking, presentation skills etc.) and tools learnt over in first 3 weeks are put to use in these 2 weeks. In last week of this induction programme, fresh recruits get introduced to the sector they will be working for, where they get specific knowledge of the domain. After this 5 week programme, new recruits get to shadow one senior, or rather, more experienced person on a project. So, they are part of a team, but we do not charge our clients for this period. This helps new recruits learn while they are working with other people. This doesn’t always happen, if the project is fast paced, given the fact that hiring in this industry is very difficult. However, we always ensure that a person has the right skills and exposure to the domain before he ventures out on his own. The moment they are out of an induction programme, they get to interact with CXOs in the industry, so we prepare them for this as well, in our induction programme. KJ: Analytics industry is crippled with high attrition. How do you manage this, especially when you are investing so much in the training? We have to invest in people, without expecting anything in return. If people leave, they leave. However, we have experienced that when you trust people, they respond. And this thought process always works, at least it has worked for us. In 2012 (Calendar year) the attrition at Fractal Analytics was 14%, in 2013 it rose a bit, but we got the figure down again in 2014. The reason for this is that we have created an environment where we trust our people. There is no monitoring, people can come in any time and they can go any time. Our employees have that freedom. In fact simple expense re-imbursement policy, dress policy, no private parking spaces, no cabins, are some of the policies which help us create this culture. We have created a system where analysts can move out of their project on their own. If an analyst is not interested in a particular project, we help him find another role within Fractal. There is complete flexibility to choose your own career path. We believe that “You are the CEO of your career, and we respect the choices you will make.” We don’t micromanage our employees’ decisions. Through these policies, we endeavour to take all the noise surrounding an analyst, away, so that he can focus on the work at hand. We want our people to focus on creating the best analytical solution for our clients, and in turn make Fractal a great place to work. It is our endeavour, to make Fractal the most respected player in this industry. KJ: What are the challenges occupying your mind currently? SV: One big challenge for us has been getting good people in offices outside India. Through our policies, we have got access to a very good talent pool in India, but this is not fully true for the US market. We have a relatively small office in the US. This is something we plan to change over time. The other challenge we face, is that a lot changing in this industry rapidly. Half-life of knowledge is about 3 years. Hence, we need to be aware of the latest tools and techniques. In order to address this, we have created Fractal Academy where people can get trained in various aspects of analytics. We have integrated platforms like eDX and Coursera and people get credit in Fractal Academy for completing relevant courses on these platforms. Analytics consultants – Traditional client facing consultants who meet client, capture their requirement, design solutions and help implement the solutions. Data scientists – These people are not facing clients, They work on algorithms, software codes and machine learning (e.g. Recommender systems). Programme managers – BI programme managers create easy to use and visually appealing programmes so that information can be retrieved on click of a button. Now we are hiring people in these different roles. 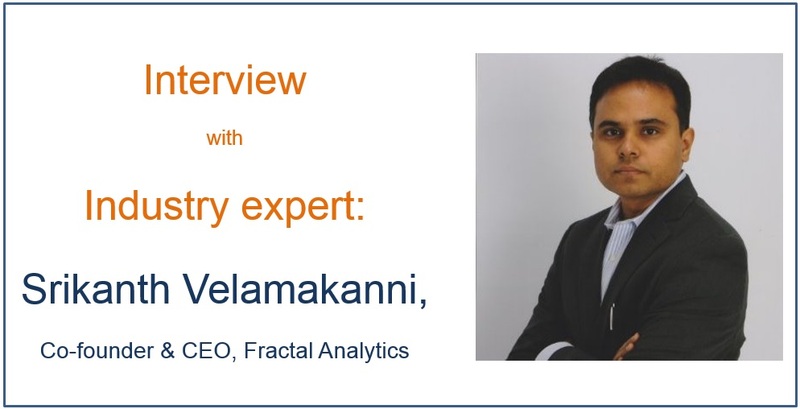 In the concluding part of this interview, we will share strategic bets for Fractal over next few years, Srikanth’s view about how Analytics industry will shape up and his advice to audience of Analytics Vidhya. Stay tuned with us and we will be out with the final part of the interview shortly.